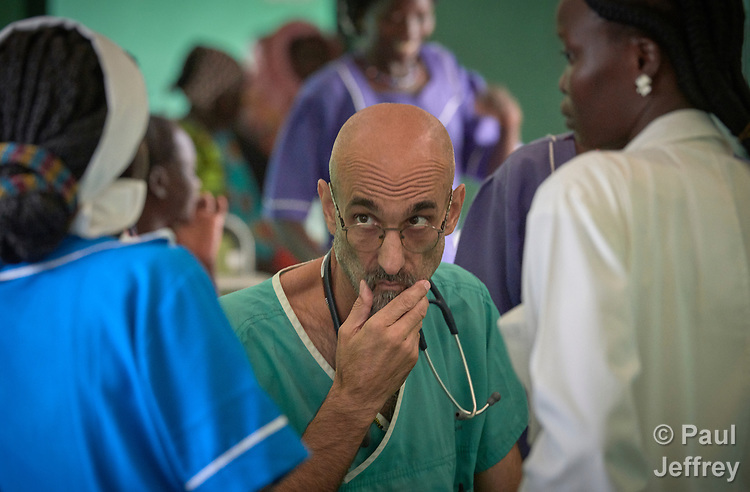 Dr. Tom Catena, a Catholic lay missionary from the United States, listens to a nurse during rounds in the Mother of Mercy Hospital in Gidel, a village in the Nuba Mountains of Sudan. The area is controlled by the Sudan People's Liberation Movement-North, and frequently attacked by the military of Sudan. The Catholic hospital, at which Catena is often the only physician, is the only referral hospital in the war-torn area. Catena is popularly referred to as "Doctor Tom".